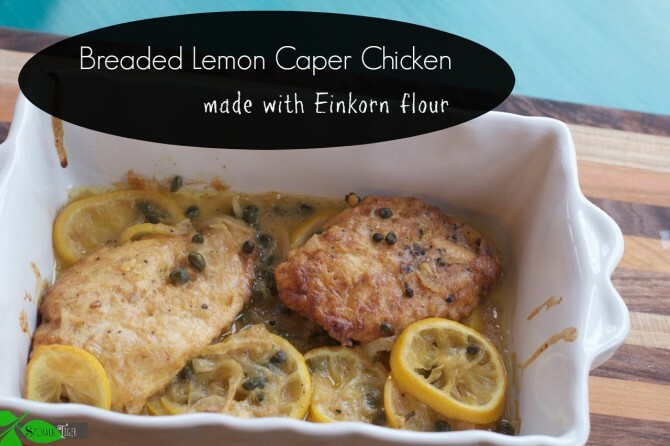 Breaded Chicken with a lemon caper sauce. Pound Chicken breasts very thin. You will probably get 4-6 pieces of chicken. Season with salt and pepper, both sides. Mix flour, paprika, garlic powder in plate for dipping chicken. Mix egg and Pecorino cheese. Dredge chicken into egg mixture, then flour and than again in egg mixture. Heat coconut oil in pan to brown chicken. Brown chicken in coconut oil. Does not need to be cooked through as it's going in oven. Use a baking dish to bake chicken in oven. Slice lemons. Put in baking dish. Lay chicken on top of lemons. Rinse capers and pat dry. Add to chicken. Scrape pan drippings and melt 1 tablespoon of butter in same pan. Add in onion and garlic, cooking until onions are soft. Add broth. Have a lid ready, as it may bubble. Mix water and 1 tablespoon of flour in a jar. Shake well. Add to broth. Add two tablespoons of butter to pan. Cook on low for 15 minutes. Pour over chicken and bake 30-40 minutes.